Penrose and Gurzadyan have an intriguing new paper that claims there are low variance structures in WMAP in the form of concentric circles. 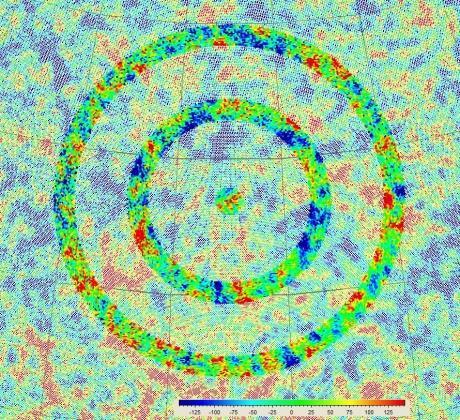 They point to this as evidence of a pre-big-bang cosmology such as the one described in Penrose’s new book. The ides is that these features come from events just prior to the start of the big-bang e.g. where a black hole is in its final throes of decay. I am not totally convinced by this explanation but if the low variance circles are real and statistically significant then they certainly must be a signal of something. The level of significance is important of course. You may remember that everything up to and including the initials of Stephen Hawking have been found in the microwave background already. 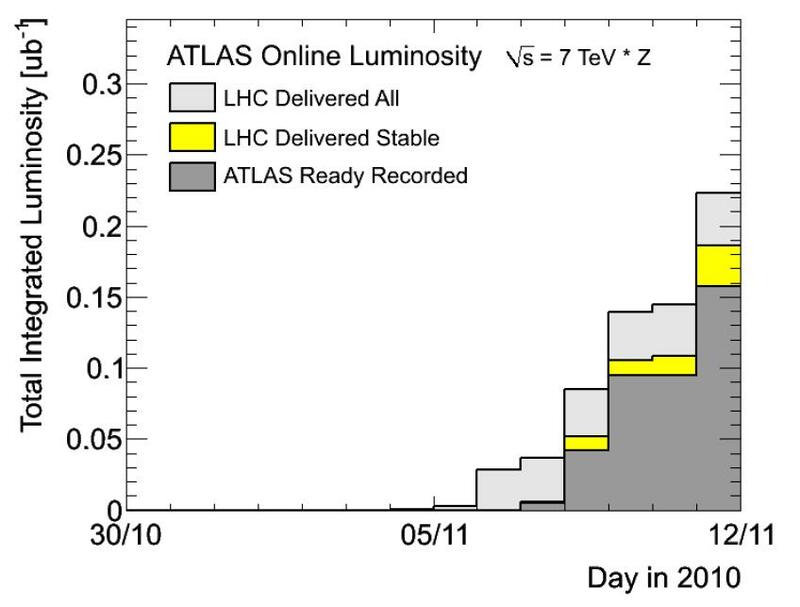 Update (2-Dec-2010): There is a workshop being webcast with first heavy ion results. In case you are reading this afterwards the slides are here. 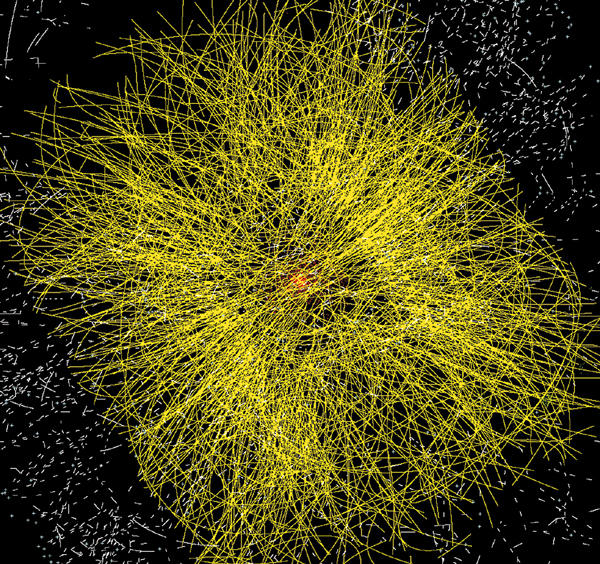 With the outer tracking systems turned on the images of heavy ion collisions from ALICE get even better. Up to 3000 charged particles are produced and tracked as the radiate out from the central collision point. As they reach the outer detector they are bent by powerful magnets so that the energy of each one can be measured to get a complete picture of the fallout from the quark gluon plasma produced in the centre of the detector. 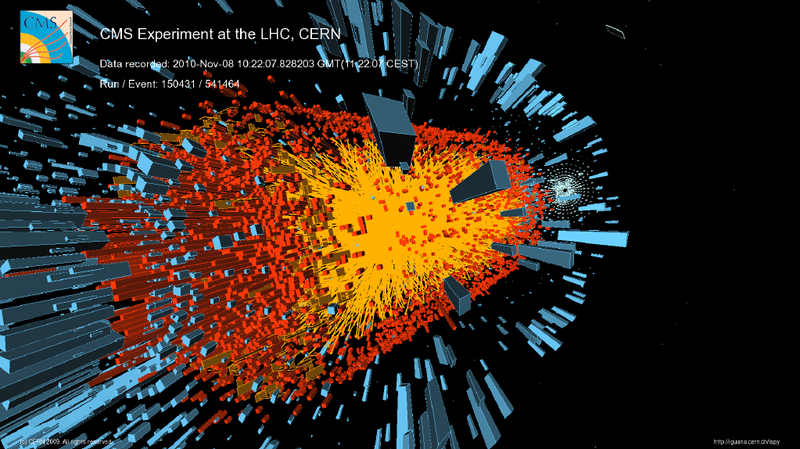 The Large Hadron Collider has succeeded in colliding lead nuclei at a centre of mass energy of 574 TeV. 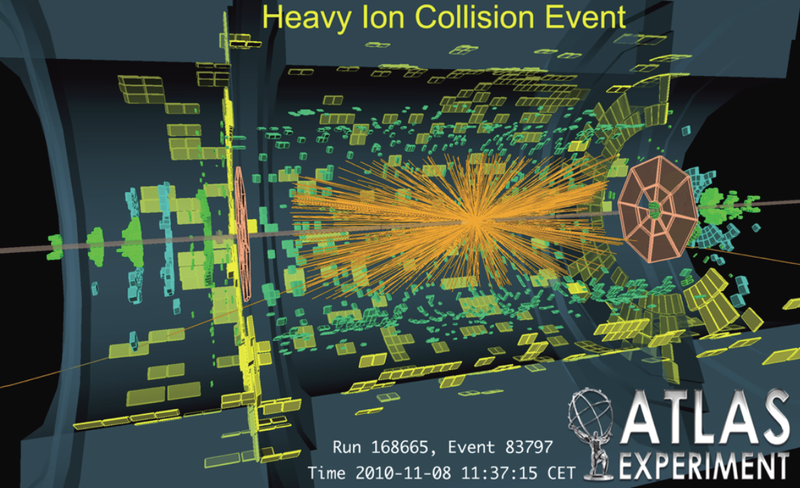 That is by far the highest energy collisions ever seen in any particle accelerator exceeding previous records of the RHIC collider by a factor of 14. 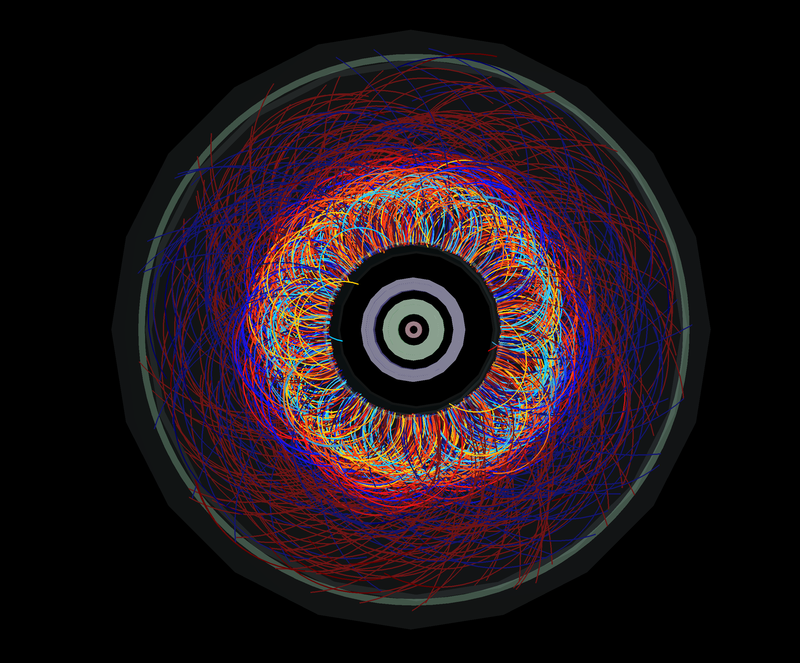 The process of commissioning heavy Ion collisions at the CERN accelerator started less than three days ago so the speed with which they have started collisions is impressive. 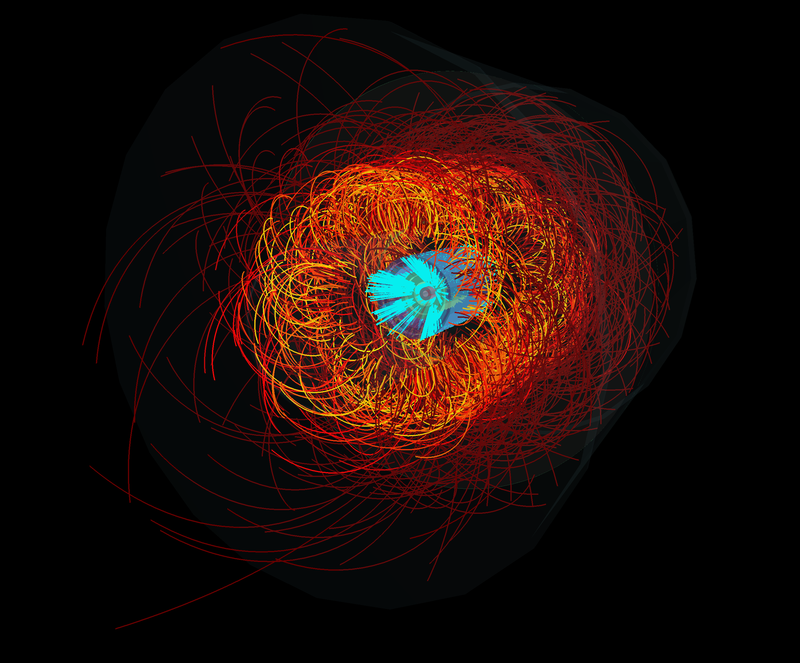 In fact the physical process of colliding heavy ions is almost identical to colliding protons. The lead nucleus has a charge of exactly 82 times the charge on a proton, but the curvature of a particle in a magnetic field depends only on the ratio of charge to energy. So if the lead ions are accelerated to exactly 82 times the energy of the protons they will follow the same path and the setup used to collide protons works just as well for ions. The luminosities used last night were just a fraction of the records set with proton collisions a few days ago, but the lead ions have a larger cross-section so some interesting data may already have been collected in last night’s run which lasted three hours. Two bunches per beams were used to provide collisions in CMS, ATLAS and ALICE, but it is the ALICE detector that is best suited to studying the showers of thousands of particles that these collisions produce. 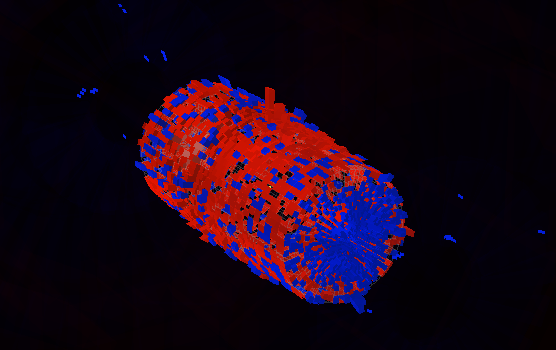 Here is a simulated picture of a collision in ALICE. Hopefully some real pictures will be available soon. Update: they are, see below. Update: Collisions have been underway again this afternoon. Here is a picture of a collision from CMS. This was taken from the Live CMS fireworks display. 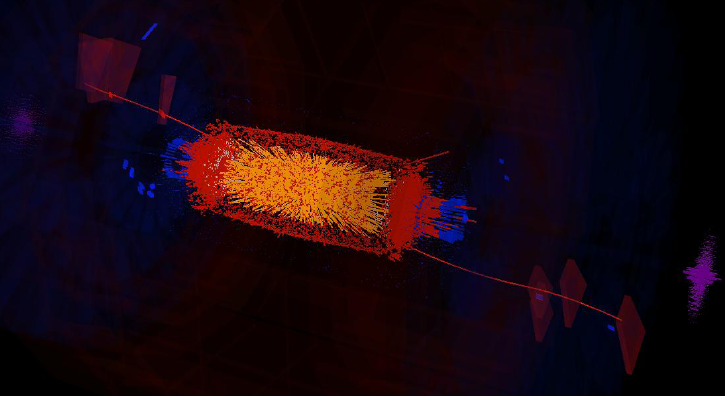 Today the LHC is ending proton on proton physics for 2010 as planned and moving on to heavy-ion physics. The pp runs that started back in February have been outstandingly successful. A peak luminosity of 201/ub/s was reached on one run, and that’s twice the set target. This means that collecting 1/fb of data during 2011 as planned should be possible. The really good news is that the stability of the systems and the proton beams proved to be better than hoped. This meant they were able to surpass the target luminosity without having to take the collider to the limits it is capable of. Next year they have the option to increase the luminosity even further . The experiments collected about 45/pb of data each and that might be enough to find some new physics. We may hear something about that at conferences scheduled for the winter months. They could easily have collected more data this year but the higher priority was to understand the running of the collider with closer bunch spacings so that they can make a well-informed plan for the early part of 2011 when they will set the run parameters for next year. The commissioning has not been without its hitches. That would be too much to expect from such a large and complex machine pushing well beyond known boundaries. Most of the problems that have cropped up have been solved. However, they have still not traced the source of “The Hump” which still sometimes plagues the stability of the beams. Then there were UFOs and Ufions which are though to be dust particles in the beam pipe that trigger the protection systems and dump the beams. They also have problems with an electron cloud which is producing high unwanted backgrounds in ATLAS. The recent runs at 50ns also turned out to need “scrubbing” to clean up the beams. The last few days were spent trying to understand these issues so that they can implement fixes during the shutdown, or at least understand how to work round them and plan accordingly. None of these problems are show stoppers and overall there is no doubt that the LHC has performed very well this year. This is surely down to some good decisions from the management together with the hard work of the thousands of dedicated individuals who have been looking after the many components of the experiment. 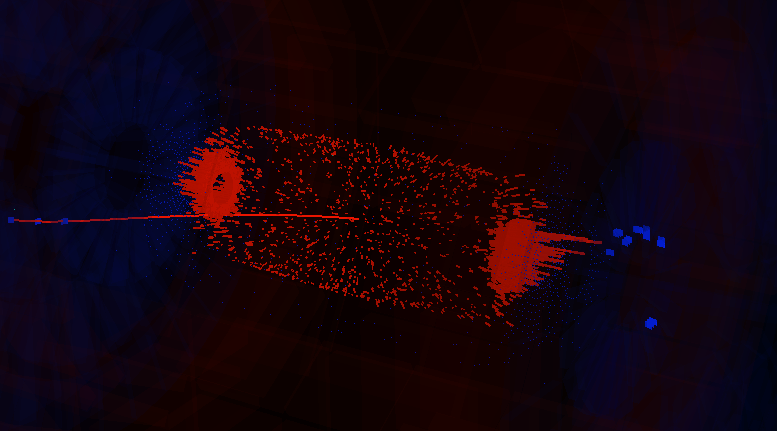 Update: Ion beams have already been circulating in the LHC today! You are currently browsing the viXra log blog archives for November, 2010.